Mahindra has launched a special edition of its entry level sedan the Verito. The special edition has been dubbed the Executive Edition and comes at a price of Rs. 7, 09,034 lakh (Ex-showroom, Delhi). The Verito Executive Edition is available only in one trim, the top-end diesel, D6. 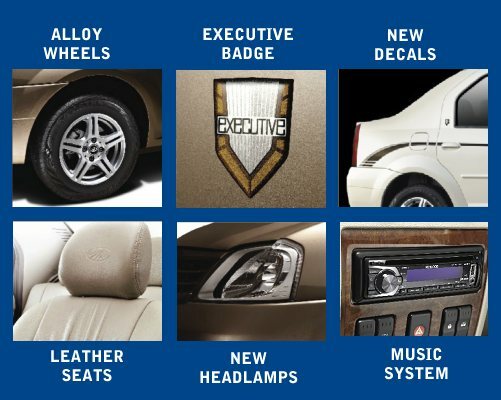 Mahindra has packed the Verito Executive Edition with special features like ten spoke alloy wheels, leather upholstery an audio system with USB and Bluetooth, blue vision headlamps, a pinstripe decal, body cladding and an ‘executive’ badge on the car’s exterior. The Verito Executive Edition is available in two exclusive body colors, Pearl White and Walnut Brown. Let’s take a closer look at the vehicle and its features with the help of a table. Now all that extra bling you get may or may not appeal to you as a buyer. However what is certain is the increase in price, so here’s a table with prices of the Verito Executive Edition across major cities. The Verito Executive Edition costs Rs. 37,226 more than the regular Verito D6 (Rs. 6, 71, 808). What would be the value of the additional features that are there in Executive Edition if you were to buy them yourself? Well, according to our estimates, buying genuine leather upholstery for the Verito would cost roughly Rs. 20,000 while the alloy wheels would cost another Rs. 20,000 (approx) depending on the brand and design pattern. Also read: What makes the Mahindra Verito a value for money car? Other features such as Blue vision headlamps, body cladding, decals and labor charges will further add up to more than Rs. 40,000 overall. But, since Mahindra is charging only Rs. 37,226 for all the above features, we feel it is a cost-worthy buy.